Kumaraguru College of Liberal Arts and Science, Coimbatore has advertised in THE HINDU newspaper for recruitment of Professor/Associate/Assistant Professor jobs vacancies. Interested and eligible job aspirants are requested to apply on or before 30th May 2018. Check out further more details below. About College: Kumaraguru College of Liberal Arts & Science (KCLAS) is a premier college in South India and we offer an education that broadens the mind and “liberal” thinking that encourages the questioning of assumptions and reliance on facts that can be interpreted differently through different lenses. We open the doors, enabling the mind to go wherever it wants in the pursuit of knowledge and understanding. It bends toward openness instead of containment. We offer comprehensive curriculum through which students will gain strong foundational knowledge and a wide range of other courses that the students may not have exposure in a regular undergraduate program. 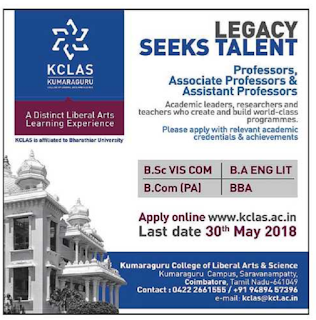 How to Apply: Interested candidates can apply online www.kclas.ac. in, on or before 30.05.2018.